Whenever I’m at a restaurant and there’s an item of the menu that has avocado, all the other plates instantly become inferior. To be honest, I never thought that avocados could be anything but savory, but to my surprise they are incredibly versatile. It’s a great substitute for meat and butter, especially when you’re baking! Plus, it’s a good fatty food. It is often considered an aphrodisiac (and rightly so! ); it has numerous vitamins, can be used in your hair and skin, and tastes delicious. I still haven’t come across a dish that isn’t improved when guacamole or avocado is added to it. What more could we ask for? 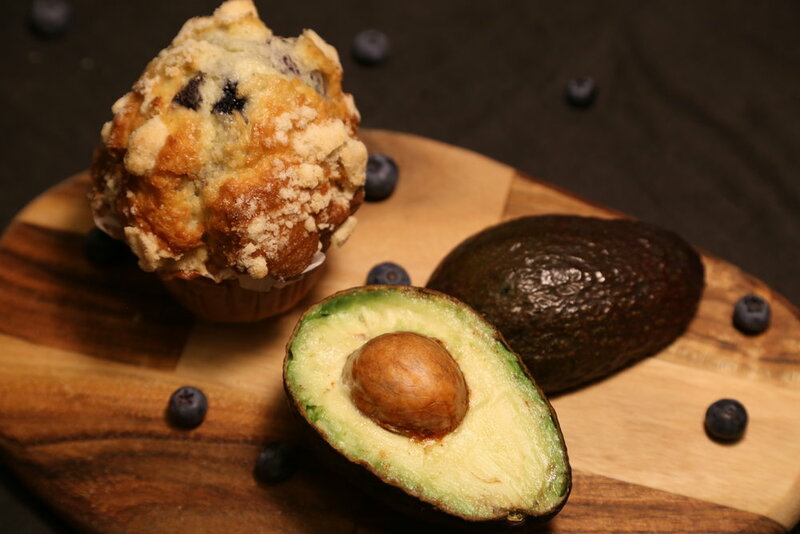 In my quest for finding the perfect avocado-based pastry, I tried avocado brownies and plain avocado muffins, but nothing compares to these avocado blueberry muffins. It is the ideal amalgamation of velvety and fruity flavors. Besides being easy to make, they also last a long time. If you want them to last for a couple of days, I would suggest double wrapping them in Saran wrap. Preheat oven to 375ºF. Line a muffin tin with 12 paper liners or reusable silicone cupcake cups (these are one of the best inventions in culinary history, it makes cleaning and removing the cupcakes out of the mold a thousand times easier!). In a large bowl, stir together dry ingredients—flour, baking powder, baking soda, salt, and cinnamon. Hint: For the next part it would be helpful to use a hand mixer in order to blend the avocados into the mix better, but it is not necessary. However, it can quickly get messy, so I would suggest mashing the avocado into a guacamole-like texture before adding any other ingredients. Once the avocado is nice and smooth, add sugar, and mix until well blended. Add egg, vanilla, and yogurt, and continue beating until completely combined. Gradually, add half of the flour mixture into the batter, beating until just combined. Gently fold in the blueberries by hand; they could break if you use a hand mixer. Spoon batter evenly into prepared muffin cups. To make the streusel, whisk the ingredients until crumbly, and layer on top of each muffin. Bake for 25-30 minutes. Cool before eating. Photo taken by Benic Han.